This prostrate or horizontal growing variety has a rich blue colour which intensifies during the winter. 'Tropical Blue' can be used as a low growing plant or ground cover whether in a border, rockery or to cover an area. 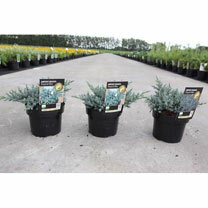 Supplied in a 3-5 litre pot.